Kansas Wesleyan knew the McPherson Bulldogs relied on turnovers and offensive rebounds. The Coyotes didn’t allow McPherson to feast on miscues. 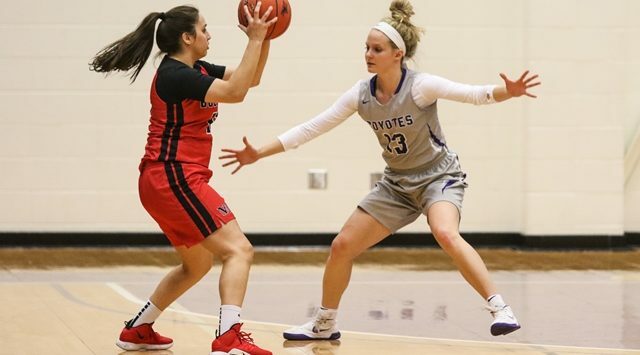 KWU held Mac to one field goal in the first quarter, scored 13 points off 19 McPherson turnovers, and the Wesleyan women’s basketball team cruised to a 72-55 victory in its 2018-19 KCAC home opener. McPherson’s (5-4, 0-4 KCAC) first bucket didn’t take place until the 5:09 mark in the opening stanza as the Coyotes jumped out to a 10-3 advantage. Wesleyan would only add to the margin from there, ballooning the cushion to 23-7 after one, relying on 10 forced turnovers. Following a 40-23 lead at halftime, Kansas Wesleyan (4-4, 2-1) extended the advantage to as many as 27 late in the third. The Coyotes had two players in double figures, led by senior Sydney Mortensen and junior Courtney Heinen. Mortensen was named the Salina Ortho Player of the Game, scoring 10 points on three treys. Heinen added 10 as well. McPherson was paced by leading scorer Sonerka White, who ended up with nine points on 3-of-11 shooting. Kansas Wesleyan heads to Winfield to face Southwestern Thursday. Pregame at 5:45 on FM 104.9, ksal.com and the Rocking M Media app. KWU’s potential game-winning shot turned sour when Marquis Kraemer’s layup rolled off the rim with six seconds left, rebounded by Frederick Watts, who fired ahead to Chamaje Barideaux for the finger roll at the buzzer. Both teams traded blows early in the contest before settling with a 14-14 stalemate with 12:39 remaining. McPherson (5-3, 2-2 KCAC) grabbed the upper hand with 11 minutes to play in the first half, but Wesleyan answered by outscoring the Bulldogs 23-8, jumping ahead 41-27 with 4:06 left. The Coyotes (3-3, 1-2) exited the locker room with a 12-point cushion, but slowly watched the lead slip away as they were ice-cold from the field, making just 25 percent of their shots in the second half. Kraemer finished with a career-high 16 points and four steals to earn the Salina Ortho Player of the Game. Junior Jordan McNelly added 11 points on 3-of-10 shooting. Sophomore AJ Range just missed out on a double-double with nine points and nine rebounds. McPherson was paced by Lual Magot, pouring in 17 points on a perfect 6-for-6 shooting night to go with his seven rebounds. KWU returns to the road to face Southwestern on Thursday. Pregame at 7:45 on FM 104.9, ksal.com and the Rocking M Media Network.